Meditation is a natural state of the human mind—at rest, open, alert. The practice of meditation has been taught for over 2,500 years as a vehicle for realising the beauty and magic of the ordinary world without aggression or manipulation. The teachings of Shambhala Buddhism emphasise the potential for enlightenment inherent in every situation or state of mind. Through discipline, gentleness and a sense of humor, the practitioner is invited to let go of conflicting emotions and ‘wake up’ on the spot. Meditation instruction is available to anyone, free of charge. We offer introductory instruction to newcomers and follow up instruction to other practitioners as part of our Open House program, and at other times by appointment. Instruction is not just for new meditators, it is also recommended as part of our ongoing practice. You are always welcome to come in and speak to a guide about your regular practice and you may even ask to form a working relationship with the instructor of your choice. 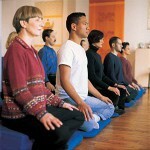 Introductory meditation instruction presents the basic meditation techniques taught in the Shambhala community. In our tradition, meditation instruction involves more than the communication of a technique; it is about the transmission of the revolutionary view that unconditional wisdom and compassion are the very ground of our being, and that by learning to relax more and more fully, we allow this fundamental nature to flower. Shambhala presents many opportunities for students to deepen their practice and study—public meditation sessions, weekend programs, retreats and seminaries, to name a few. A meditation guide can help you decide what to do next and when to do it. The work day world is where ‘the rubber meets the road’. Getting the tools to meet life’s ups and downs with a strong and pliable mind and an open heart is another potential benefit of working with a meditation instructor.